For now we are focusing on two pipelines that we in the northeast of Turtle Island are fighting: Enbridge’s Line 9 pipeline and TransCanada’s Energy East pipeline. Some of our stories in the northeast talk about two insatiable serpents, some of two-headed snakes… This much is true: Our Ancestors Knew. They understood the battles ahead of us and the struggles of our time. Fallible, fragile, and forbidden to pass – pipelines are an essential piece of the tar sands project. Pipelines are one of the main arteries within which tar sands bitumen is transported. If there is no way to transport bitumen it cannot reach the market (domestic or otherwise) and cannot be profited upon. Stopping the pipelines is a key part to stopping the tar sands, which is not to mention the direct, immediate and ongoing threats to our territories these pipes carry. Each pipeline project is different. The materials, number of pipes (often multiple lines running parallel in the ground), length of the segment and diameter may vary. Before new pipe has been laid, excavators will trespass onto our territories, without requesting permission, submitting notification or obtaining free, prior and informed consent. This is why we need our people to defend our lands and stop such projects dead in their tracks. Excavators are the first step in the process of clearcutting forests, which is followed by digging massive trenches into the earth and eventually installing pipelines. Aside from the pipelines themselves, pipeline routes also require pumping stations which regulate the flow and pressure of the content being transported (bitumen, fracked gas, etc). Although some pipelines are designed to connect directly with refinement facilities, other infrastructure related to pipelines often includes marine terminals where receiving vehicles, trucks, or supertankers load up. Pipelines are not a “safer” way of transporting tar sands across Turtle Island. There have been several incidents of major pipeline spills in the last few years often dangerously close to our communities. A chilling reality about pipelines is that they will eventually burst resulting in carcinogenic (cancer-causing) and toxic substances being released. Pipeline ruptures result in contaminated lands and waters ultimately poisoning animals and humans alike. These pipelines carrying tar sands (bitumen) are likely to burst much sooner because of how corrosive the substance and its additives are. Tar sands (bitumen) are actually a heavy solid with a consistency that has often been compared to peanut butter. In order to get the tar sands to move through pipelines, the tar sands are diluted with toxic substances such as fracked gas and known human carcinogens. In addition, the entire mixture must be heated to extremely high temperatures and put under intense pressure. The industry considers what are known as pinhole leaks to be “normal”. These leaks are very small (the size of pins), and they emerge consistently throughout these tar sands pipelines. Pinhole leaks are problematic for two major reasons: 1) tar sands diluted bitumen (also referred to as “crude”) is leaked directly into the soil around the pipelines consistently over time, contaminating the ground there and eventually seeping into the water-table, effectively impacting entire ecosystems; 2) they compromise the overall integrity of the pipeline, which ultimately will lead to rusting, eroding, larger cracks and eventually bursts. 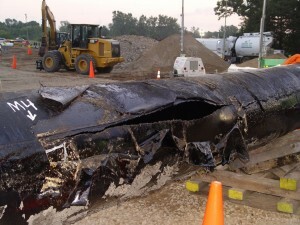 Wherever pipelines are, they rupture. Our lands and waters are not safe with these pipelines and the assemblages of the extraction industry running through our territories. For this reason, as well as the legacy of death that the tar sands bring with them, we must stop the construction of tar sands related infrastructure and attack it wherever it exists.